APRIL 2015 UPDATE -- During April we prayed concerning . . .
UPDATE: On 22 April rebels in Syria launched what Stratfor Global Intelligence describes as 'one of the largest and most ambitious operations of the Syrian civil war'. The operation, labelled 'The Battle of Victory', brings together as many as 12,000 mostly international fighters -- including Chechens, Moroccans, Turkmen and Britons -- from more than 40 jihadist groups, including al-Qaeda's al-Nusra Front, Ahrar al-Sham and the US-backed Free Syrian Army. The jihadists' main aim is to sever the Syrian Arab Army supply line running east-west [between Latakia and Aleppo] through the al-Ghab Plain in the region of Jisr al-Shughour, Idlib Province (marked on map). On Saturday 25 April the jihadists -- who are entering Idlib via Turkey (the leading sponsor of both al-Nusra and Islamic State) -- captured strategic Jisr al-Shughour. On Sunday 26 April Syrian government forces commenced bombardment of rebel targets across Idlib. Heavy fighting is taking place in the al-Ghab Plain. Doubtless al-Qaeda has its sights set on the Alawite heartland of Latakia, now also home to many thousands of displaced Armenian and Assyrian Christians. The anti-Assad regime-change coalition (the US, Saudi Arabia, Turkey and Qatar) refers to Latakia as a 'regime stronghold', ignoring the fact that it is a safe-haven for ethnic and religious minorities. That the Arabs and Turks are willing to sacrifice many thousands of Alawite and Christian lives is unsurprising. That the West is willing to do so, is beyond comprehension. * KENYA (RLPB 304), where home-grown terrorists -- mostly ethnic Somali Kenyan nationals -- are targeting Christians and threatening national security. This is a problem not only for Kenyans, but for over 500,000 Somali refugees now facing forced removal back to Somalia, especially the secret Christians amongst them. Please pray. * GENOCIDE: THEN AND NOW (RLPB 306), commemorating the Centenary of the Armenian Genocide -- a horror in which 1.5 million Armenian, 500,000 Greek and 750,000 Assyrian Christians were murdered, deported and starved as part of a wide-scale campaign of ethnic-religious cleansing amidst the chaos of WWI and the unravelling of the Ottoman Empire. It is a history that is repeating itself, not just with regard to the killing and expulsion of Christians, but with regard to the shameful stony silence of the West. So how is it that Germany can accept responsibility for the Holocaust and for the Armenian Genocide, yet Turkey remains resistant? Answer: Christianity produces a guilt culture in which sin and shame are dealt with through acceptance of guilt, confession and repentance which opens the way to reconciliation through gracious forgiveness. Islam, on the other hand, being supremacist, produces an honour-shame culture in which sin and shame are viewed as something to be swept away -- be that through honour killing or the rewriting of history. That the nations may be healed, please pray that the Gospel of Jesus Christ will take root in Turks, Kurds, Arabs and Muslims everywhere. On 12 April Sadhvi Deva Thakur, a leader with the Hindu Mahasabha (a Hindu nationalist political party), stoked controversy by saying that the government should impose 'emergency measures' forcing Muslims and Christians to undergo sterilisation to restrict their growing populations. Insisting Hinduism was under threat, she also recommended that Hindu idols be placed in all mosques and churches. The Global Council of Indian Christians (GCIC) has appealed for Prime Minister Narendra Modi's intervention, maintaining that Sadhvi Deva Thakur should be charged with sedition as her statements are a direct assault on India's secular constitution and pose a threat to communal harmony. On 20 April, just days after a church was vandalised in Agra, Hindu Mahasabha stated that it is not illegal to attack churches, adding that it would actually give awards and protection to Hindu youths who attack churches. Pray for the Church in India. Islamic State (IS) has claimed responsibility for the 18 April car bomb outside the American consulate in Ankawa, the largely Assyrian district on the northern outskirts of Erbil, the capital of Iraqi Kurdistan. More than eight people were wounded and two Turkish nationals (ethnic Kurds) were killed. No consulate staff were killed or wounded. Just four days earlier authorities arrested four Turkish construction workers accused of having links to IS. Whilst the attack was a failure, it is deeply concerning that IS could infiltrate what is regarded as Iraq's safest city. Most of the 70,000 displaced Assyrians in Erbil are sheltering in Ankawa. 'We hope this refuge remains solid and strong and safe,' said Fr. Behnam Benoka in Ankawa. 'This is what we hope because we have nowhere else to go.' Please pray. World Watch Monitor (WWM) reports that in February a Coptic school teacher named Gad Younan (42) filmed on his phone a group of Coptic youths mockingly imitating Islamic State fighters. Subsequently, his phone was lost and found by Muslims who watched the footage and filed a complaint with police. On 7 April Younan was arrested and charged with 'contempt of religion' proving that -- unlike many Western politicians -- masses of Muslims really do see IS as representing the religion of Islam. Over the next three days, Muslims rioted in Younan's village, pelting Coptic homes and businesses with bricks while chanting Islamic slogans. For the Copts it was three days of sheer terror. On 9 April the parents of four of the Coptic youths in the video handed their sons over to the police in the hope it would appease the Muslims, while Coptic priest Rev. Azer Tawadros (65) appealed to the government for help. Security forces arrived on 12 April and restored order. A 'reconciliation' meeting was held on 17 April in which it was affirmed that Islam is a religion of 'tolerance and forgiveness'. So that peace might be restored, the Christians agreed to expel Gad Younan from the village. Younan and the four youths remain in police custody as a court considers their cases. Christian security under Islam is tenuous indeed. Pray for Egypt's long-suffering, persecuted Christians. On Sunday 19 April Islamic State (IS) released another video message to 'the Nation of the Cross' showing the execution of 28 ' followers of the hostile Ethiopian Church'. Sixteen of the Ethiopians were lined up in the bush in Wilayet Fezzan (southern Libya), forced to their knees and then shot through the head. 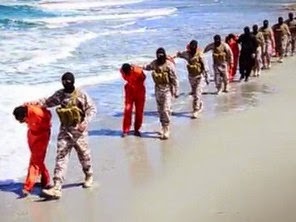 The other twelve were marched onto a beach in Wilayet Barqa (eastern Libya), lined up along the shore, forced to their knees and then simultaneously beheaded. On 28 March Muhammadu Buhari won Nigeria's presidential election by 3.1 million votes. When Buhari lost the presidential race in April 2011, he claimed that the polls (deemed free and fair) had been rigged and the presidency stolen from him. His claim triggered three days of Muslim rioting across the north in which more than 800 people were killed and over 65,000 displaced. Praise God, President Goodluck Jonathan stayed true to his Christian profession and conceded defeat with grace and dignity while appealing for calm in the national interest. 'Nobody's ambition is worth the blood of any Nigerian,' he said. 'The unity, stability and progress of our dear country is more important than anything else.' This was the only scenario that could have avoided violence. Please persist in prayer for Nigeria for although Buhari boasts of being a 'born-again democrat', he has proved himself previously to be a dedicated Islamist. * UK: ON THE BRINK OF CULTURAL COLLAPSE? RLPB 294 (27 Jan 2015) appealed for prayer regarding the case of Victoria Wasteney (38), a senior occupational therapist who had been suspended for sharing her faith with a Muslim nurse with whom she had become friends. Deeming the disciplinary action offensive and unfair, Wasteney appealed. On 8 April the Employment Appeals Tribunal ruled against Miss Wasteney, affirming that it was inappropriate for her to pray with her colleague and invite her to church. The judgement found the hospital had not acted with any prejudice or religious discrimination. The ruling sets a sad precedent. The UK elections scheduled for 7 May are expected to be the closest in UK history. Polls indicate that neither the Tories nor Labour will win outright, meaning whoever wins more seats must form a coalition, giving minor parties the balance of power. Meanwhile, a Muslim group with links to fundamentalists maintains it will influence the outcome of up to 30 seats, making it the 'kingmaker'. Muslim Engagement and Development (Mend), which has released a Muslim Manifesto for the UK, boasts of being in talks with Tory, Labour and Lib Dem leaders. For its part, Labour has already pledged to have 'Islamophobia' (code for criticism of Islam) deemed a hate crime. Pray for revival in the UK. RLPB 306. GENOCIDE: Then and Now. -- an RLPB commemorating the Centenary of the Armenian Genocide. On the night of 24 April 1915 the Young Turk government arrested over 200 Armenian intellectuals and community leaders in Constantinople (Istanbul) and dragged them off to prisons in central Anatolia (modern day Turkey). 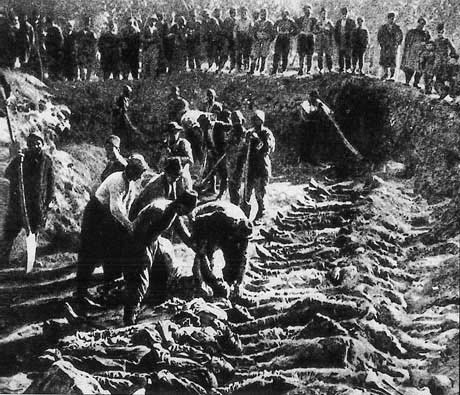 This event, known today as Red Sunday, is generally regarded as the beginning of the Armenian Genocide as it was the first in a series of arrests and deportations that saw 2,345 leading Armenians arrested, deported and (mostly) summarily executed. By 1923 some 1.5 million Armenians (out of a total population of two million) had been savagely murdered or deported and starved to death by Turks who had been incited to kill and who were guaranteed impunity. The Armenian Genocide occurred in the context of a wide-scale ethnic-religious cleansing in the Turkish heartland as the Ottoman Empire unravelled. Also eliminated were at least 500,000 Greeks throughout Asia Minor and up to 750,000 Assyrian Christians throughout Mesopotamia. Whilst the Turks must bear most of the guilt, Kurds and Arabs were also involved. Though 24 April 1915 is regarded as the start of the genocide, the killing actually began much earlier. Through the 19th Century, as the Ottoman Empire became 'the sick man of Europe', the captive Christian nations long-subjugated within it grasped the opportunity to agitate for independence. Inevitably, Christian uprisings were brutally suppressed and Christians executed, massacred and deported into slavery. Generally Russia (long the protector of Eastern Christians) would intervene in defence of persecuted Christians as was its right according to the Treaty of Kuchuk-Kainarji, brokered by Catherine the Great in 1774. In 1853, after issuing several warnings, Russian troops crossed into the Danubian Provinces in defence of severely persecuted Greek Christians (although Europe regarded this as a mere pretext for imperialist expansion). Aware that defeat was imminent, the Turks appealed to Britain for help. The Ottoman Empire's size, along with its location between imperial Europe and imperial Russia, afforded it economic and geo-strategic value. Not only did Britain have economic interests in keeping the Ottoman Empire united and strong for the purpose of free trade (which Britain believed was the key to world peace), it had geo-strategic interests in keeping Russia hemmed in. So Britain and France entered the Crimean War on the side of the Ottoman Turks. In exchange for British support the Sultan agreed to enact reforms aimed at improving the situation of his Christian subjects. 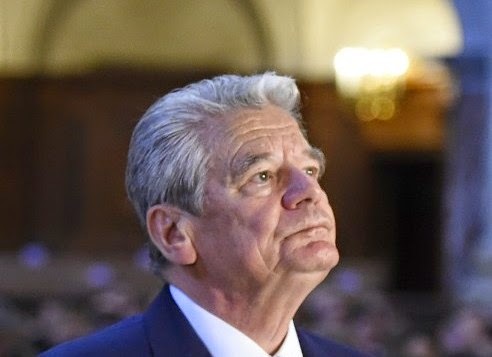 The reforms, guaranteeing religious freedom and equality before the law, were aimed at bringing an end to the Christians' status as dhimmis (second class citizens, without rights). Muslims, however, rejected the reforms, deeming them anti-Islamic. Viewing the removal of jizya (protection money) as a green light for jihad, pogroms and massacres became the order of the day. In 1860 some 20,000 Christians were slaughtered in Syria and Lebanon. In 1876 up to 25,000 Eastern Christians were massacred in the 'Bulgarian horrors'. In 1895-96 as many as 200,000 Armenians were murdered in Turkish Armenia. Keen to maintain its pro-Muslim policies, Britain adopted a 'conspiracy of silence' regarding the killings, along with running a campaign of propaganda vilifying Eastern Christianity. So the killings continued. After the war the remnant Christians were denied their right of self-determination by pro-Muslim European powers who were convinced that the best way to modernise and soften Islam was to 'dilute' it with Christians. So it is a story not only of genocide, but of abandonment and betrayal, and the stoking of God's wrath. Today, a century of balance of power in, and Western hegemony over, the Middle East is officially over. The Muslim centre (Mesopotamia) has collapsed and the fight is on to see which regional power will fill the void: the Turks, the Arabs or the Persians; and which sect will dominate: the Sunnis or the Shi'ites. As in 1915 the minorities -- particularly the mostly Armenian and Assyrian Christians -- are facing genocide as Muslim elements exploit the chaos to launch an orchestrated campaign to tend to unfinished business: the eradication of Christianity. 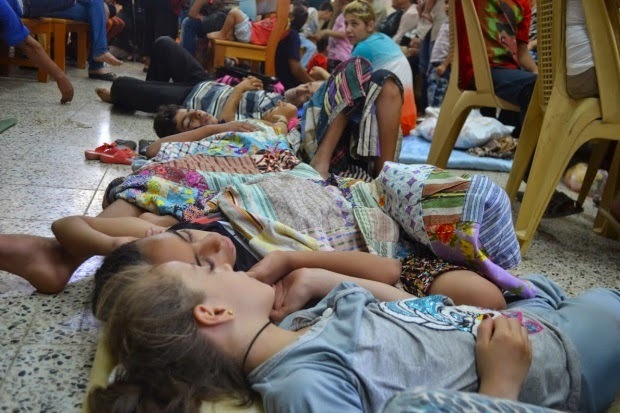 The word genocide is already being used to describe the ethnic-religious cleansing of Iraq's remnant Assyrian Christians, which has seen their numbers drop from around 1.4 million to just 200,000, most of whom are displaced. In Syria, where the West is backing and arming genocidal Islamic forces, the future of remnant Armenian and Assyrian Christians hangs in the balance. 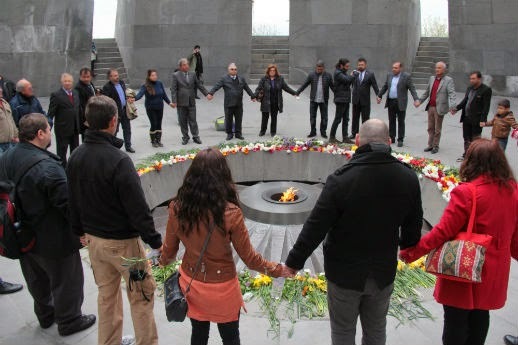 In Turkey, where the dark clouds of neo-Ottomanism and Islam have rolled in and the government is vilifying Armenians and 'missionaries' as the ultimate threat to Turkish national security, Christians are vulnerable. Just as in 1915 the West is enacting pro-Muslim policies to advance its own 'interests': allied to the Turks and Arabs against Iran and against Syria's President Assad; allied to Iran against Islamic State; and backing Shi'ites in Iraq and Sunnis in Syria. All the while the West is totally unwilling to aid the minorities and help them establish safe havens for the prevention of genocide. Yet again, Christians are being eliminated and all the West has to offer is a shroud of deathly silence and a campaign of propaganda against anyone who would assist them. In the absence of repentance, how else could God respond but with judgment? As the West has delivered Christ's precious children into the hands of his and their enemy, so he will deliver the West into the hands of the same enemy! Indeed, Europe has already drunk from ‘the Cup of the Lord's Wrath’, the effects of which will soon be manifest. These are days for reflection, confession and repentance. These are days for lamentation as a shameful history repeats itself and Christians suffer unimaginable horrors. 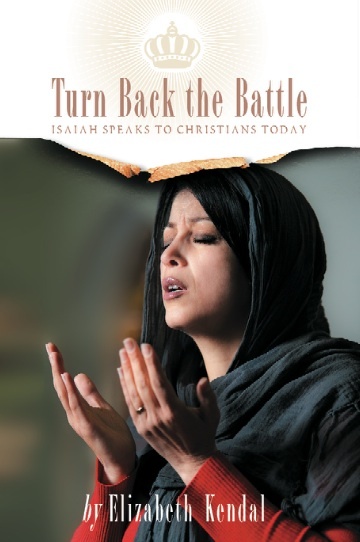 Most of all, these are days for serious intercessory prayer that the God of the Cross will be at work in the darkness and that he, in grace, will turn back the battle. * that God will pour out a spirit of reflection and repentance over all those nations who have been complicit in genocide against the Lord's people, either through sins of commission [actual killing] or sins of omission [failing to intervene]. * for all those Christians across the Middle East today who are displaced and imminently imperilled -- especially Armenian and Assyrian Christians in conflict-wracked Syria and Iraq; may our loving heavenly Father, the Almighty King of kings and Lord of lords, provide all their needs -- material (such as shelter, security, food, water and heating) and spiritual guidance, comfort, peace, and grace. * that the Church will rise to be the Church she is supposed to be: One Body IN Christ and a light to the world! May there be a willingness to show solidarity with those who suffer; to give generously to those in need; and to end the silence, especially our shameful silence before the Throne of Grace! Commemorating the Centenary of the Armenian Genocide. The Armenian Genocide occurred a century ago in the context of wide-scale ethnic-religious cleansing in the Turkish heartland as the Ottoman Empire unravelled. 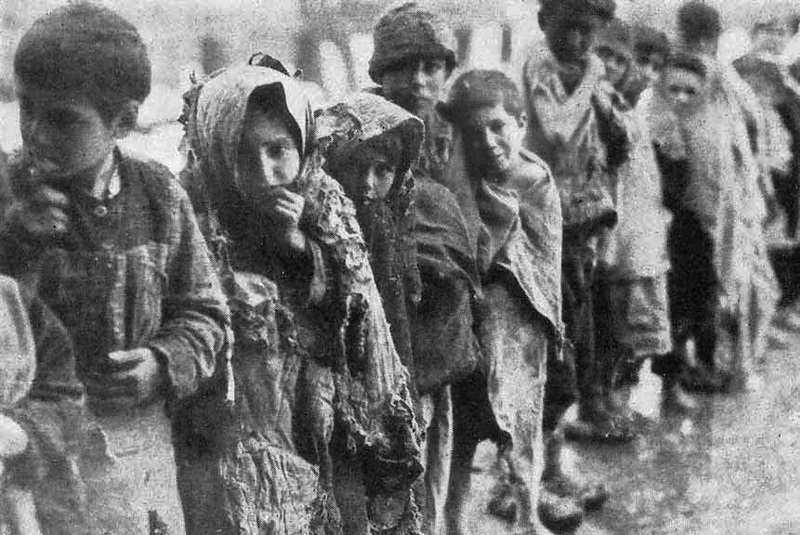 Between 1915-1923, some 1.5 million Armenians, some 500,000 Greeks and up to 750,000 Assyrians had been savagely murdered, or deported and starved to death. The West abandoned and betrayed its Christian allies thinking its interests lay in a pro-Muslim foreign policy. Today, history is repeating itself as Muslim forces exploit the chaos in Syria and Iraq towards eradicating Christianity. As in 1915 Christians are being eliminated and all the West offers is a shroud of deathly silence and a campaign of propaganda against anyone who would assist Christians. These are days for the Church to repent and to rise in solidarity with the persecuted. Churches and fellowships using the Summary above might also provide a copy of the listed prayer points to be used in their worship by people who are leading in intercessory prayer. Syria might exist in theory, but not in reality. After four years of war, Syria is little more than a patchwork of sub-state entities protected by militias. President Assad and the Syrian Arab Army (SAA) are fighting to protect the coastal province of Latakia and the north-south corridor between Damascus and Aleppo. Dominated by Alawites, this ethnic-religiously mixed entity includes Druze, Shi'ites, Armenian and Assyrian Christians and the secular Sunni business elite. To the above end, Idlib's fall to Jaysh al Fateh (the al-Nusra-led 'Army of Conquest') [see RLPB 303 (1 April)] could be a game-changer. Bordering Turkey, Idlib extends south like a wedge between the coastal Alawite stronghold of Latakia and the commercial capital of Aleppo. 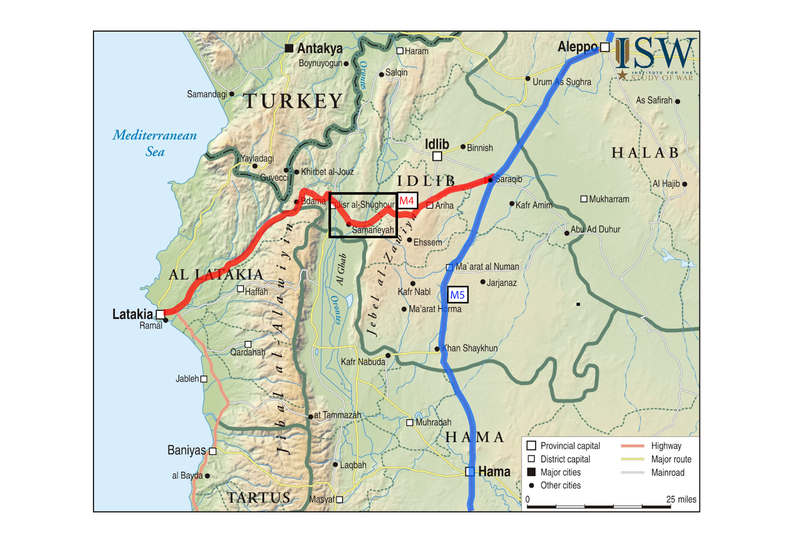 Idlib extends into the north-south corridor with a large section of the M5 Damascus-Aleppo Highway passing through it. Latakia and Aleppo are both imperilled. 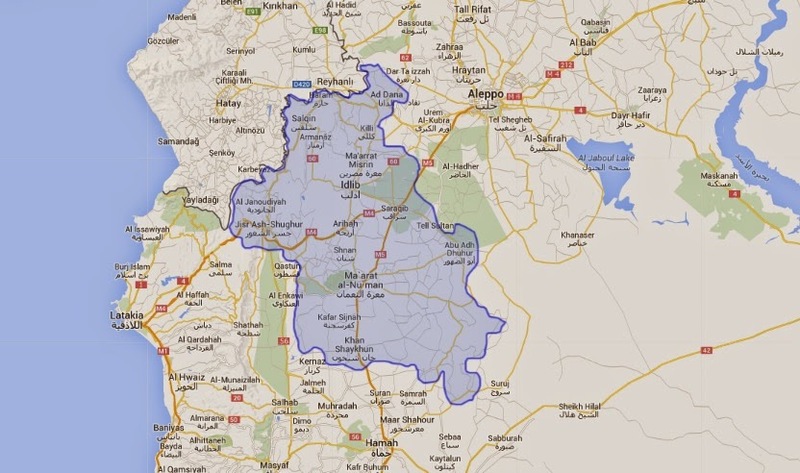 Aleppo now has al-Qaeda to the west, Turkey to the north and Islamic State (IS) to the east. Furthermore, Turkey and Saudi Arabia are planning a military alliance (comprised of Turkish ground troops and Saudi air-cover) to assist the jihadists (whom they refer to as 'Syrian opposition'). They may even install an alternative government in Idlib, Libya-style. For the Sunni powers, the US-Iran nuclear deal has brought a new level of urgency to the conflict. They believe that if regime change (the political-religious realignment of Damascus) is going to happen it must happen now as Iran is only going to grow stronger. Accordingly the war is about to move to a new level at a time when borders have closed and getting out of Syria has become virtually impossible. On 31 March, just days after entering Idlib City, foreign fighters from al-Nusra (al-Qaeda) publicly executed two Christian citizens -- Elias Naguib (83) and his son Nael Elias (44) -- after learning they owned a shop that sold liquor (probably a licensed grocery store). Having refused to abandon the Christian remnant ahead of the Jaysh al Fateh offensive, Father Ibrahim Farah (57) of the Antiochian Orthodox Church of Idlib City, has now been abducted along with several from his church's congregation. According to Middle East Concern, they are to be tried in an Islamic court, although no details of charges or demands have yet emerged. Christians have been ordered to submit and pay the 'jizya' (protection money) or leave Idlib. Most have fled to the port city of Latakia, many bearing shrapnel wounds and deep trauma. One father got his 9-year-old daughter out of Idlib via sewerage channels; his parents remain in the city. The Syrian government will fight vigorously to regain control over Idlib. The mostly frail Christian remnant remaining in the city will have to survive not only al-Qaeda but massive aerial bombardment. Islamic State (IS) has launched an offensive in Aleppo Province, where it is fighting mostly other Islamic groups for total control of the region (according to Stratfor 10 April). Amidst this, al-Nusra has been shelling government-held areas of Aleppo City. From 9 pm on 10 April (Good Friday), well into the next day, rockets rained down on the mostly Armenian and Assyrian Sulaimaniyah district, killing more than 20 Christians, including children. Al-Nusra also launched 'barrel bombs' / improvised shells into the market in central Maadi district, killing 20 more civilians (including Christians). They also detonated a huge tunnel bomb near the air force intelligence headquarters before attempting (unsuccessfully) to storm the base. Intensive fighting continues. On 1 April armed groups including al-Nusra (al-Qaeda) seized control of the Nasib border crossing into Jordan, forcing the Syrian Arab Army to retreat and opening the way (temporarily) for free movement of trained jihadists into Daraa and severing a major Syrian government supply line. By 6 April an alliance of Al-Nusra and IS fighters had seized control of Yarmouk, a Palestinian ghetto/'camp' just 6km south of Damascus. 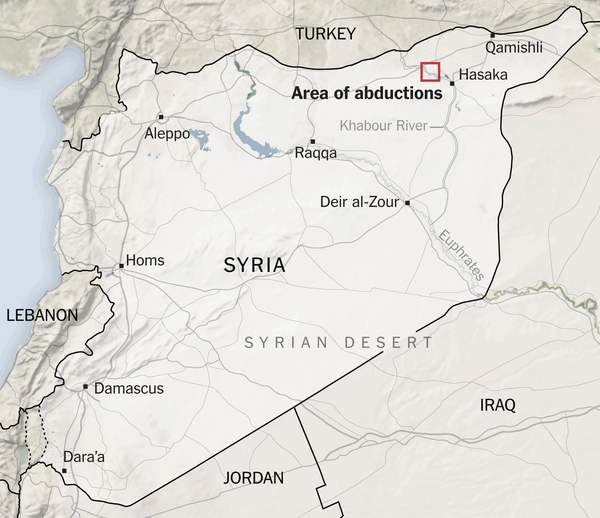 In the south, al-Qaeda is based in the Qalamoun Mountains between Lebanon and Syria where they co-operate with IS. Analysts suspect al-Nusra and IS fighters will seek to cut the M5 Highway between Damascus and Homs (in the centre), which would leave Damascus, Latakia and Aleppo isolated and encircled. Should that happen, Iran may well take control of the Syrian conflict to ensure that Damascus remains aligned with the 'Axis of Resistance'. * the Lord our shepherd will lead his threatened and imperilled people through these dark days; may the Lord give all Christian leaders great spiritual discernment, wisdom, courage and conviction to lead his people according to his good will and purpose. 'Your way was through the sea, your path through the great water; yet you footprints were unseen. You led your people like a flock by the hand of Moses and Aaron.' (Psalm 77:19,20 ESV). * our Sovereign and merciful God will intervene in Mesopotamia, so that Western powers will stop backing regional powers and fuelling the conflict; may they instead start supporting the region's vulnerable minorities and establishing safe havens for the prevention of genocide. 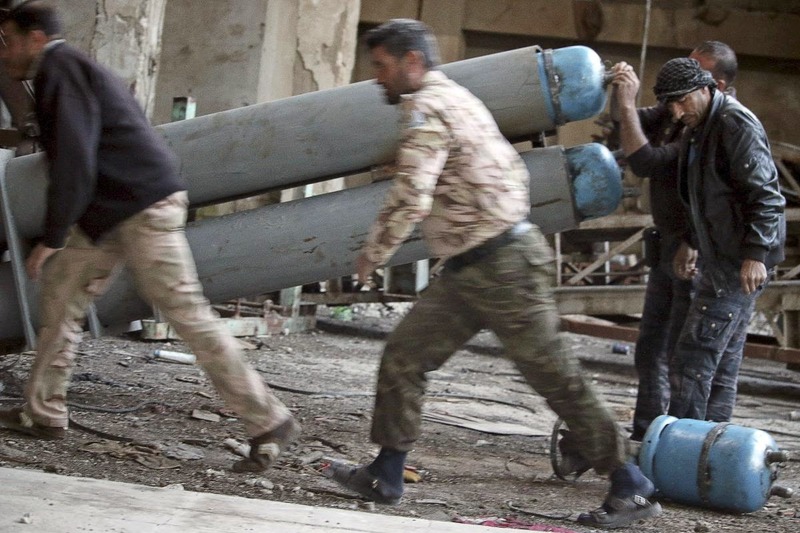 In September 2014 the US government resumed sending weapons to the 'moderate Syrian opposition', including anti-tank missiles critical in al-Qaeda's conquest of Idlib. Turkey and Saudi Arabia are planning a military alliance to aid the 'moderate Syrian opposition'. They believe the US-Iran nuclear deal will empower Iran and regime-change in Damascus must happen now before the window of opportunity closes. Over Easter al-Qaeda forces shelled Christian districts of Aleppo, killing dozens and wounding many more. Meanwhile, IS has launched offensives in both Aleppo Province (north) and Damascus (south). A coalition of al-Qaeda and IS fighters now controls Yarmouk, a southern suburb of Damascus just 6km from its CBD. The war is escalating markedly at a time when escaping from Syria is virtually impossible. 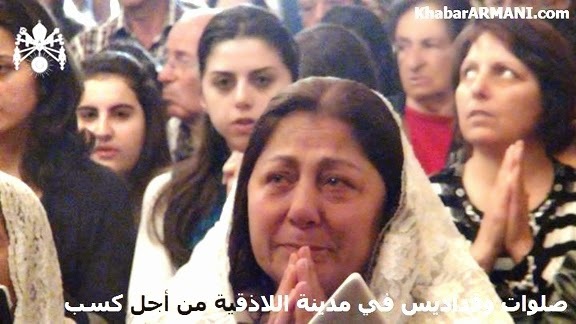 Please pray for Syria's remnant Christians. Inaugurated in 2011 the newly built Garissa University College took its first full-year student intake in 2013. Many students profess to being dumbfounded that the government would build a university in a region of such extreme insecurity. Whilst the population of Kenya is 82 percent Christian, North Eastern Province, which borders Somalia, is close to 90 percent Muslim -- largely ethnic Somali -- and can be a hostile place for Christians. Most of the Garissa University College's students were Christians who had been unable to gain admission into their preferred colleges. Despite the threat, the college had only two security guards on duty at any time. One of the guards employed by the college was an ethnic Somali Kenyan national who turned out to be an al-Shabaab sympathiser; he helped facilitate the 2 April attack that left 148 mostly Christian students dead. The mastermind behind the massacre, Mohamed Mohamud, is on the run. Also an ethnic Somali Kenyan national, Mohamud was formerly the principal of a Garissa madrasa (Islamic school). He joined al-Shabaab in Somalia before returning home to lead the group in Kenya. Four of the five gunmen were also ethnic Somali Kenyan nationals -- one was even a promising law graduate and the son of an official. It will be of great concern to Kenya that this latest attack appears to have been fully home-grown. According to survivor Helen Titus, upon arrival the gunmen went straight to the lecture hall where Christians were holding an early morning prayer service. The first to die was the young woman leading in prayer. Kenneth Luzakula was standing at the back of the prayer meeting when two gunmen burst into the room. He told Reuters, 'They killed all my friends. I was praying with them when we heard gun shots and two guys who wore hoods and carried long guns came in. I escaped because I was standing next to the rear door, so I dashed out with one other friend. I could hear my friends still praying loudly and calling the name of Jesus Christ.' 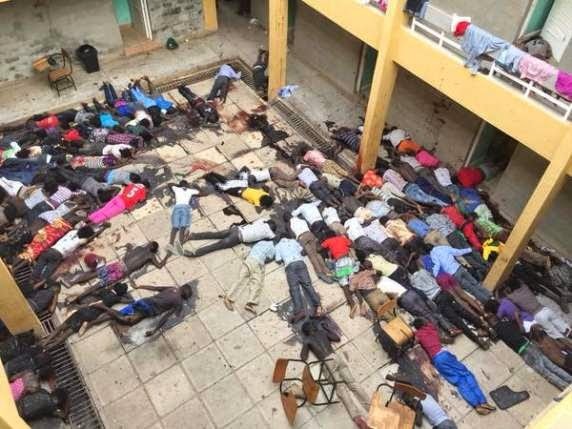 The gunmen then stormed the halls of residence, taking some 700 students hostage before separating the Christians from the Muslims and executing the Christians as they went. Some were killed when they were unable to recite the Islamic creed (the Shahada), others when they responded with prayers to Jesus. By the end of the day 148 mostly Christian students lay dead with at least 79 wounded. Garissa University College has been closed indefinitely. In their statement, al-Shabaab referred to Kenya's north-east and coast as 'Muslim lands' under 'Kenyan occupation', adding that until they are 'liberated' it will be a 'long war' and 'Kenyan cities will run red with blood'. Having deemed Muslim blood 'inviolable', more attacks targeting Christians can be expected. * give great wisdom and strength to the Kenyan government, so it will address the issue of Islamic radicalisation without hurting innocent ethnic Somalis; may the authorities have wisdom to deal with the enormous Somali refugee problem in Dadaab (100km north-east of Garissa) where al-Shabaab fighters have embedded themselves inside camps, surrounding themselves with human shields. [See RLPB 166 (3 July 2012)]. * bless Christians living, working and ministering amongst Muslims on the Swahili Coast, in the city slums and in Somali-dominated North Eastern Province; may the Lord protect them and empower all Christian ministry and witness. * shield Kenya's churches and other Christian targets while blessing Kenyan Christians with hope and grace amidst trial and suffering; may the Church in Kenya grow in faith, grace and numbers. 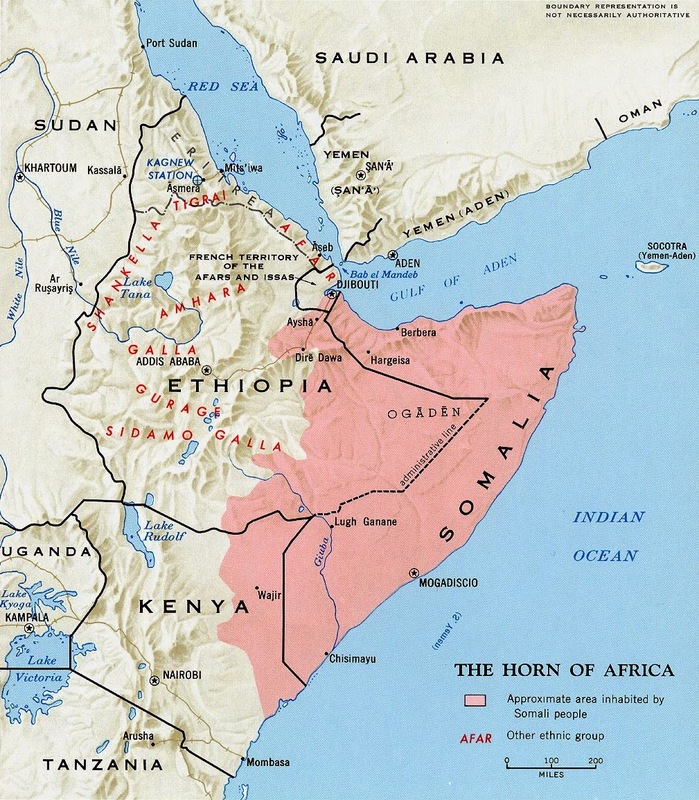 * intervene in Somalia and still the turmoil of the nation (Psalm 65:7); may peace be restored so displaced Somalis can return home; may ethnic Somalis -- amongst the most long-suffering people in the world -- be open to the Gospel of Jesus Christ, the Prince of Peace and hope of nations (Isaiah 42:1-4). 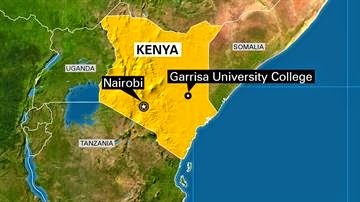 Before dawn on Thursday 2 April gunmen stormed the Garissa University College in eastern Kenya. They separated Christian and Muslim students, executing the Christians as they went. Some students were killed when they could not recite the Islamic creed, whilst others were killed when they responded in Christian prayer. Most of those involved in the massacre, including its mastermind, were ethnic Somali Kenyan nationals who have joined the Kenyan branch of al-Shabaab. They maintain that 'Muslim lands' are under 'Kenyan occupation' and until they are 'liberated' a long war will continue and 'Kenyan cities will run red with blood'. Al-Shabaab states that whilst Muslim blood is 'inviolable', the blood of unbelievers can be spilt. So more attacks on Christian targets are expected. Please pray for Kenya and its Church. RLPB 303. SYRIA plus Easter Reflection. The Cross is more than an event in history; more than an instrument of torture and death; more than an atonement for sin. The Cross is revelation, for through the Cross God reveals how he works; indeed how he is forced to work when dealing with arrogant, self-righteous, glory-orientated, sinful humanity. For it is our glory-lust that forces God to use inglorious means. So when we consider the supreme evil of the Cross and realise how much Christ suffered, not only for us but because of us, it is humbling indeed. All we can do is hang our heads, shed a tear and whisper 'thank you'. Viewing suffering and persecution through the revelation or prism of the Cross enables light and hope to be found hidden amidst darkness and despair. My dear persecuted brothers and sisters, my dear fellow intercessors, never lose sight of the Cross. It is less a burden to bear than an eternal reminder how God subverts evil and redeems it as blessing. If Islamic State (IS) really understood what the Cross reveals, they would be less inclined to remind us that we are 'the Nation of the Cross' [see RLPB 297 (16 Feb)]. Lord, help us live up to that energising, hope-inspiring, wonderful name! The Cross is more than an event, an instrument of torture or an atonement for sin. The Cross is revelation, for through the Cross God reveals how he works when dealing with glory-oriented, sinful humanity. The Cross reveals that appearances can be deceptive; that things are not always as they seem; that even in the midst of death and darkness when God seems absent and the 'world' boasts victory, the truth is found to be exactly the opposite. For notwithstanding the appearance of defeat, Christ was at work faithfully fulfilling his promises. Viewing suffering and persecution through the revelation or prism of the Cross enables light and hope to be found hidden amidst the darkness and despair. And so we pray, but not as those without hope. 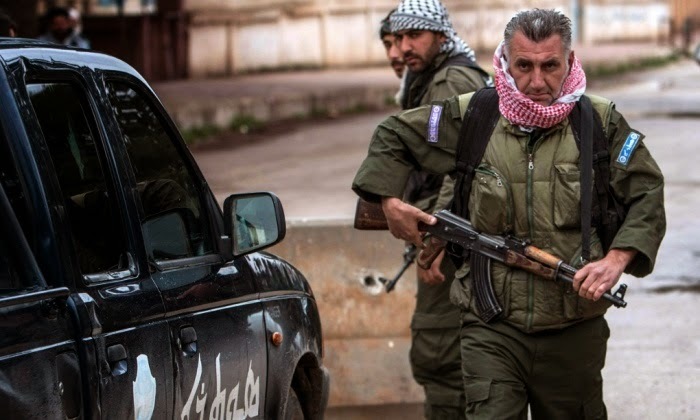 Around 23 March an alliance of jihadist groups announced they had formed an alliance, known as Jaysh al Fateh, for the purpose of seizing Idlib, the provincial capital of the highly strategic Idlib Province. 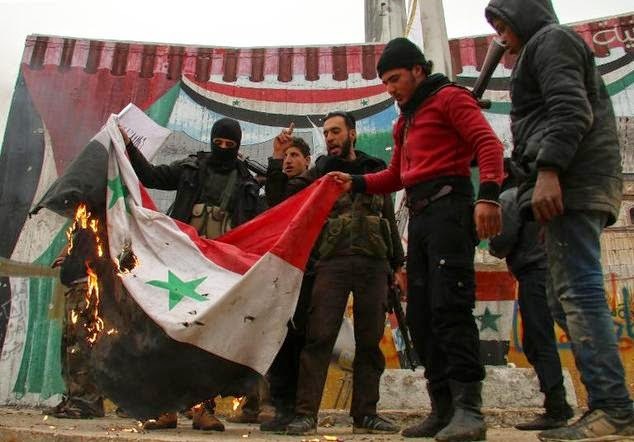 On Saturday 28 March Jaysh al Fateh's 'Army of Conquest', comprising some 1500 fighters from Jabhat al-Nusra (al-Qaeda's affiliate in Syria), Ahrar al-Sham and five other groups entered and seized the city of Idlib. Their success was due in part to suicide-bombings and because the rebels have acquired armoured vehicles, plus at least two American TOW anti-tank missiles which they deployed against the Syrian Army with great effect. 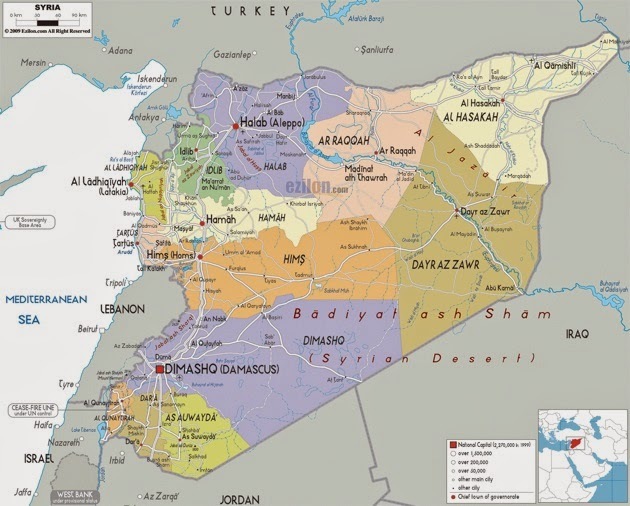 Reportedly, the Syrian government now controls only about ten percent of Idlib Province. This is a huge win for al-Qaeda. Aleppo (the jewel in the crown) is now wedged between al-Qaeda in Idlib and Islamic State (IS) in Raqqa, and risks being cut off from Damascus. Al-Qaeda and IS might have their differences, but not regarding how they treat Christians. The situation in the north-west is extremely critical. Please pray. Before Islamic State fighters raided the Assyrian villages on the Khabour River on 23 February [see RLPB 298 (24 Feb)] some 8000 Assyrians still lived in the Hasekah heartland. [Hasekah is contiguous with northern Iraq's Nineveh province.] Now they number less than 2000 and are dwindling quickly. Many are displaced and taking refuge in the provincial capital of Hasekah city. A Christian militia comprising some 450 Assyrian men (photo) has been formed to defend the remnant. Whilst they have the support of some Kurdish fighters, nobody else is helping them. Turkey has sealed the border and IS fighters have besieged the Syrian border town of Qamishli, which now hosts some 100 Assyrian families displaced from the Khabour River region. More than 200 Assyrian Christians remain in IS captivity. An official with the Syriac Union party, Sanhareb Barsom, describes the situation as 'catastrophic'. 'These people have broken down,' he said. 'Their emotional state is very bad because some of the families have had members taken captive by Daesh [IS].' Please pray. Note: In the light of our Easter Reflection, it is significant to note that in November 2013 United Bible Societies reported that Scripture distribution was increasing markedly in 'persecution hotspots'. 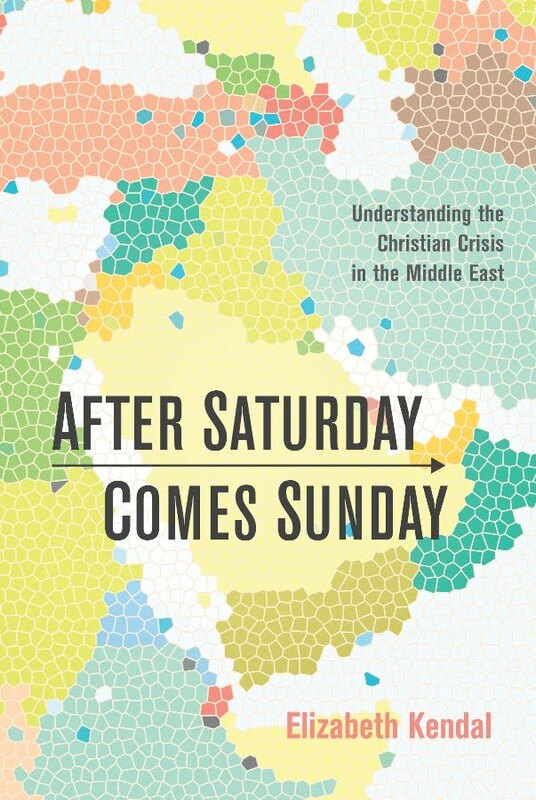 The highest increase was recorded in war-torn Syria, where Scripture distribution had increased eight-fold during 2012. The persecuted Church is on the front-line of an intensive spiritual battle -- it needs all the help we can give it. And so we pray, but not as those without hope.